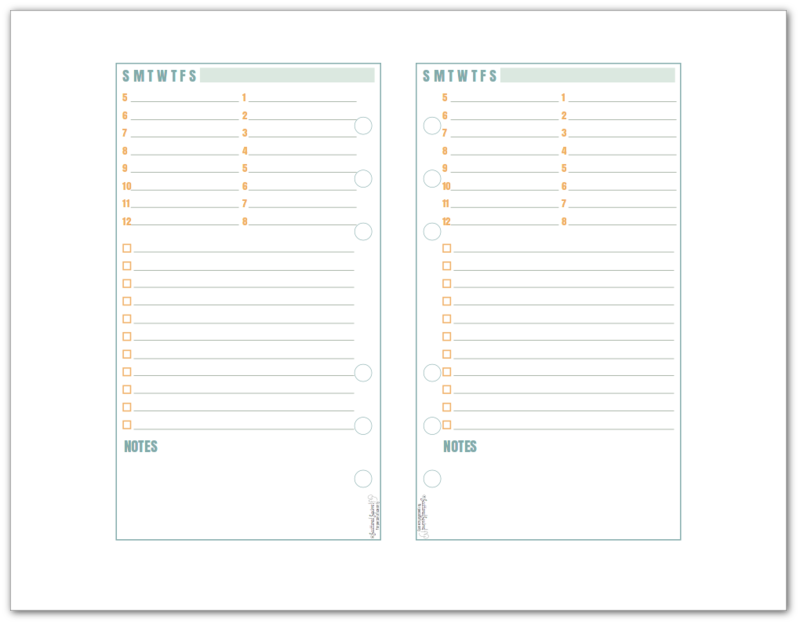 Check Out the New Personal Size Daily Planner Printables! Personal size planners are wonderful for many reasons, portability being right up there at the top. If you’re like me and have larger handwriting, or if you have a lot going on each week, their size can present a few hurdles that need to be overcome. Namely – having enough space to properly plan your days and weeks. To help combat that problem I made a couple personal size daily planner printables that can be used in a few different ways to make sure we’re making the most of these smaller pages. If you normally use an A5 (half-size) or larger style planner, chances are good that a weekly spread works well for you. Most of them afford enough room to be flexible and versatile. A weekly spread is one of the most common ones out there because it works well to fit many different needs. In a personal size planner, though, the weekly spread doesn’t leave a lot of planning space. That’s where having daily planner pages on hand can really help. You can use them when you need them for those extra busy days or use them every day to keep yourself on track. I tried to think of different ways these might be used when I made them so there are two different layout options available. Like I mentioned about, space is limited in personal size planners so I gave the layout of these a lot of consideration. I wanted to create a planner printable that was super functional. Because space was so tight I opted to skip the usual headers and titles and just keep it simple. The top of the page has the initials for the days of the week and space to write out the date. You can use it however you like. I envisioned circling the day of the week and writing out the actual date in the box when I made it. Next is the agenda or schedule area. This section gave me some grief, in the end, I had to just go with hourly segments. You know me, I never met a checklist I didn’t like. This section has a lot of versatility to it. Use it for your to-do list, shopping list, spending tracker, anything really. And lastly a section for notes. I purposefully left this area blank for those of you who like to use stickers and stamps to decorate your planners or add in some extra functionality. There isn’t much room, but what is there can be easily customized to what you need. Or you can just do like I go and jot down any notes or reminders for the following day. As always to snag a copy for yourself just click the picture and you’ll be taken to the PDF file. 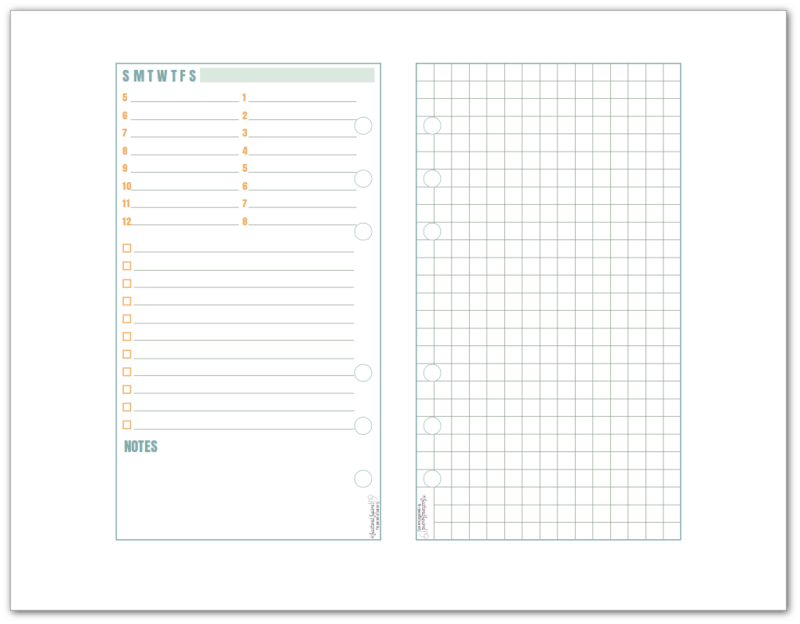 The more I thought about the ways the personal size daily planner printables could be used, the more I realized that there might be some of you who would need more planning room, whether for more notes or details about appointments, or whatever else you might need to keep track of in your planner. As you can see, this one I paired with graph paper so that you have your structured planner page on one side and your unstructured space on the other. I couldn’t resist whipping this one up to go with the others. I know it’s not really a daily planner page, but I thought it might be handy for anyone who likes to takes to take notes or keeps extra paper in their planners. 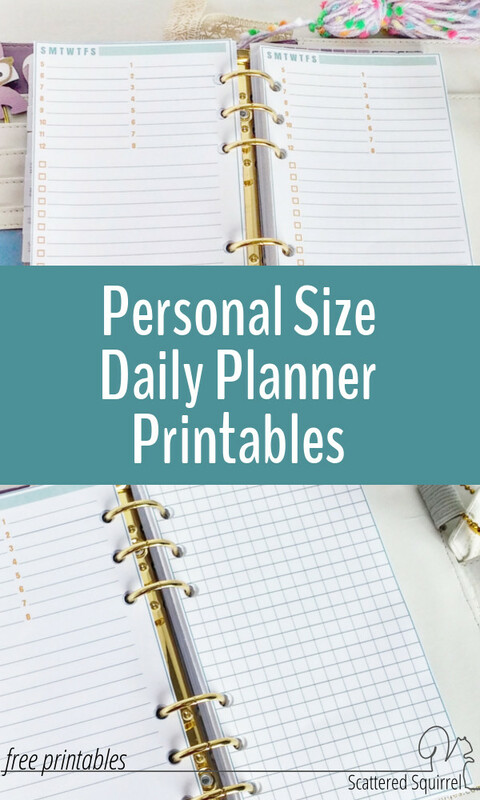 I’d love to hear what you think about the personal size daily planner pages. Do you think they’re something you will use? Would you like to see the same layout in half and full-size as well? Drop me a line in the comments below and let us know. I appreciate the daily planner sheets you have designed and especially that you make them so versatile. I noticed you didn’t get any comments on this so I really wanted you to know that at least one person really appreciates and uses this size notebook. I also include a list of books I want to read, or videos I want to watch, for when I go to the library. It’s nice to have that list handy whenever someone suggests a book or video they enjoyed. Your pages will work just fine in the sheet protector as well and can be used over and over again. Thank you for all the motivation and tools you provide. Hi Esther, I’m happy to hear that the 31 Days challenge is helping you. Isn’t it amazing what a difference those three things makes? It sounds like you have a great set up for your planner. I need to start keeping a list of books to read and movies to watch in my planner too, I’m sure I’ve forgetting more than I’ve remembered. I’m so excited about this! I haven’t found a mini planner weekly spread that I like so I have been writing my own- which look very similar to this, so I’m super excited to print these out and not have to write them out myself 🙂 Thanks! Hi Stephanie, I’m happy you’re excited about them. I’m working on a couple new ones too so that people have more colour options and a couple different layouts to choose from. So, if these aren’t quite right maybe one of those will be. Hi Neha, thanks so much. I hope you like them and find them useful. I’m so glad you like them Barbara! 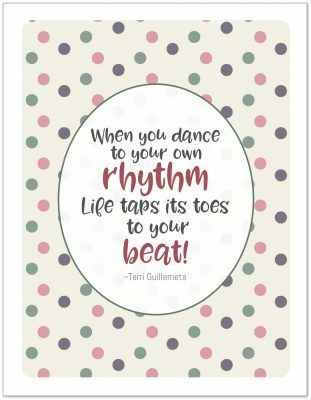 I’m SO excited about your personal size printables!!! I can’t wait to see what other layouts you will come out with!! Hi Emily. I’m happy you like them. I’m working on a few other ideas for this size. Trying to pack them with planning power without compromising usability is proving a little tricky for me, but I’ll have more ready before the new year. I’m happy to hear that these are working for you, Toni. I need to carry my planner with me too, I think that’s the reason I have a few of them. The personal size was surprisingly useful. I used to think it was too small too, but I’ve been pleasantly surprised. I hope you enjoy them! Alli, you are such a gem for sharing these with us. I can’t thank you enough. I know this will probably be an easy fix, but I can’t get them to print on both sides of the page? Any ideas? H Tracey, you’re are most welcome! I hope you enjoy them. Does your printer duplex for you? (automatically print double-sided) If it doesn’t you might need to print out half of how many you want, and then put the printed ones back into printer so that it will print on the other side. I recommend testing it on a single page to start with so you can figure out how to put the paper back in so it prints on the blank side. One thing I’ve found helpful is to mark the paper when I put it in the printer. I draw a line on the bottom of the page and write L on the left side of the page and R on the right. Then I load the page into my printer so that the line and letters are face up and closest to me. That way, when it prints, I can use that to figure out how the paper gets moved through the printer so I can figure out how to flip it so it prints the right way up on the blank side. I wish I could be more help. Every printer is different, it’s just a matter of testing it to see how it works. I personally like the Portrait half-sizes as my planner is an Avery notebook – I just purchased today – so I am happy to have found your blog – thank you so much! I am looking around to see what I can print – blessings. You are very welcome. 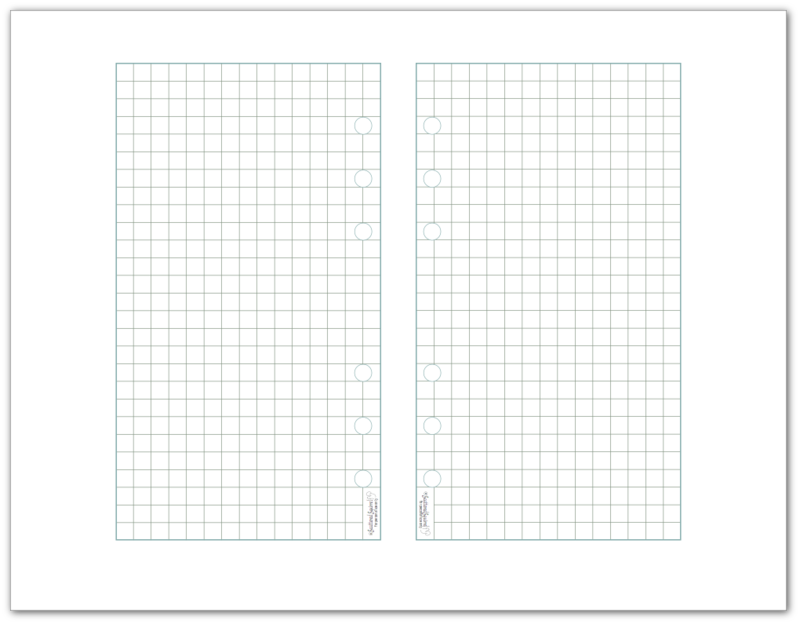 I have a lot of half-size planner printables to choose from. I’m currently working on putting them all on their own pages to make them easier to find. I hope you find some that you like. The personal printable are great. I love them and they look great. Personal size month on 2 pages would be great also. Thanks for all of your hard work. You are appreciated! 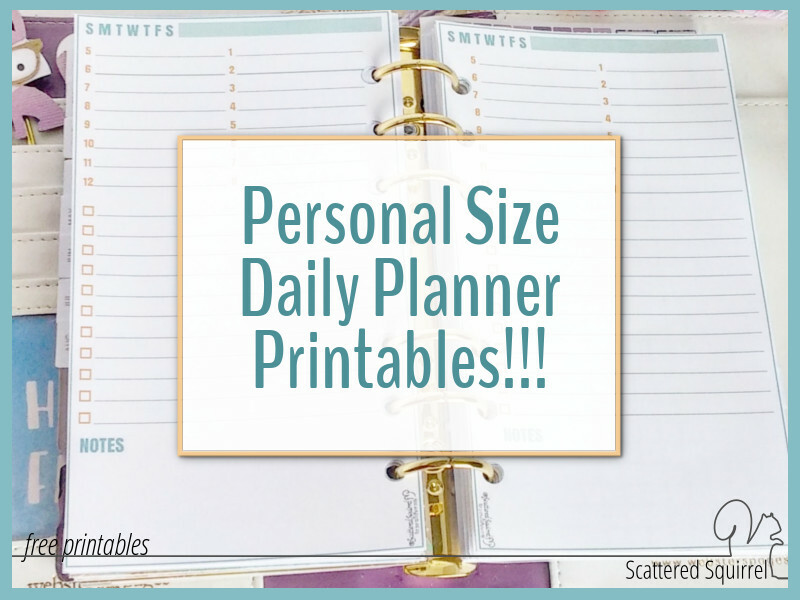 Thanks for the personal size planner printables! They work great. Oh I’m so happy you like them. I’m working on some more, just trying to figure out colours and fonts for them. Hello, I found out about your website through a YouTube video on DIY planners, I am so glad I did… Once I found out about your site I must have gone on a downloading frenzy!.. LOL, I appreciate your generous offer into making these planner inserts free, such a rare treat, especially for those who are just getting started and have no idea where to begin. I’d like to ask a question on the above printable .. I’m confused as to how to use them.. the numbers on the side make it hard for me to understand fully.. It’s numbered 5-12 and then 1-8, can you pleas explain how those numbers are to be correlated with the days of the week. Again excuse my ignorance but as I stated before I am new to the Planner community, and would like to understand more, Thanks.